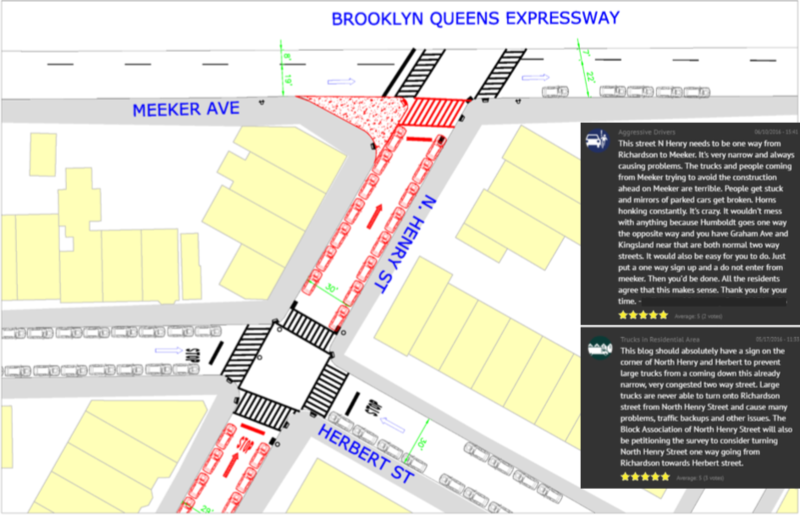 The long-awaited North Brooklyn Traffic Study, a project from the NYC Department of Transportation, funded in conjunction by Councilmember Stephen Levin (D-33), has finally arrived. 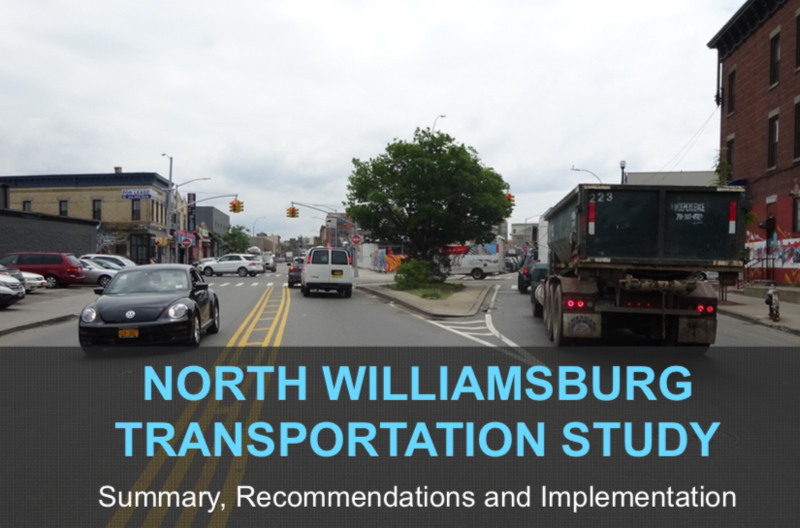 Last night, DOT staff presented their findings and recommendations to Community Board 1 in Williamsburg—which elicited mixed reactions from residents, who packed the meeting hall to capacity to hear and weigh in on the proposed changes. Truck traffic and unsafe intersections have been at the heart of the community’s complaints for a long time, and the DOT’s presentation showed a few options for mitigating the amount of off-route trucks and dangerous pedestrian crossings. Of course, like all changes to infrastructure, the benefits had to be weighed against inconveniencing certain residents for the greater good. Many of the recommendations from the study were straightforward, like removing some corner parking spots in the Industrial Business Zone to allow large trucks to negotiate turns more easily, without resorting to multi-point turns. Another would clear space at school crosswalks to allow approaching drivers to better see approaching pedestrians. But the bulk of the discussion centered around the DOT’s recommendations for three one-way conversions of narrow streets. The 30-foot wide streets, which have parking on both sides, are under the DOT’s preferred width of 36 feet for two-way streets. Congestion and sideswipe accidents—involving both parked cars and passing vehicles—have been the result. 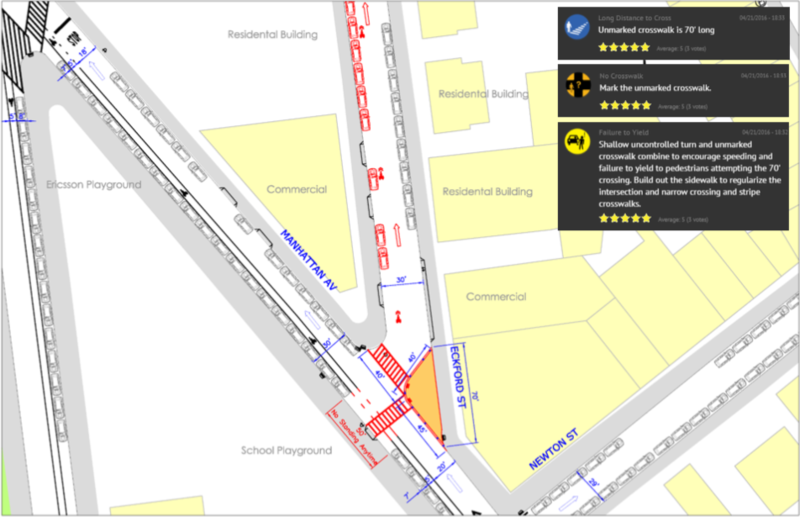 At Eckford Street, between Manhattan and Driggs, both the narrow street and the large, unprotected crossing at Manhattan pose issues. 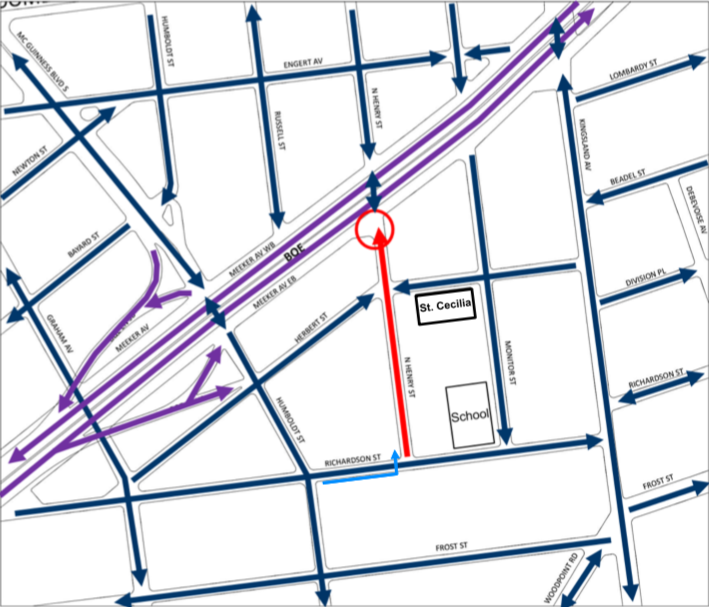 The DOT has proposed to switch Eckford Street to a northbound one-way and create some traffic calming and pedestrian safety improvements at the corner. 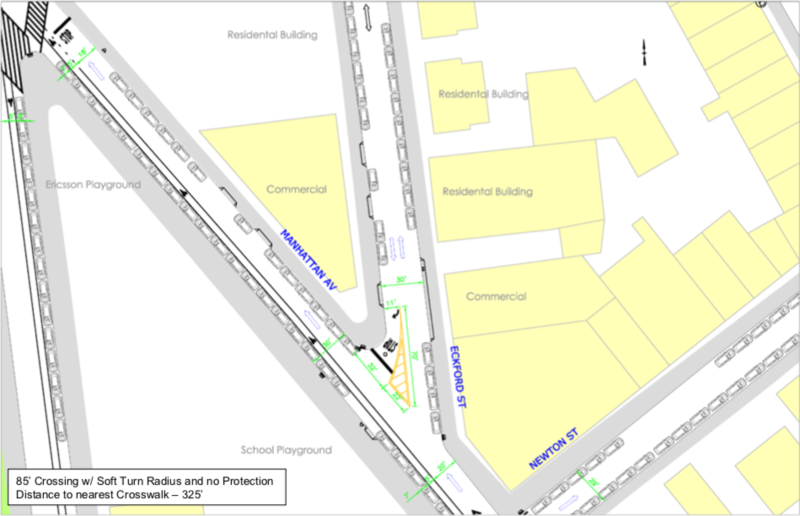 Along with the one-way conversion, the corner of Manhattan and Eckford would get a 40-foot curb extension, narrowing the dangerous 85-foot crossing to a manageable 40 feet. Marked crosswalks would be put in place as well. The curb extension would also serve to slow cars that are currently able to take the soft curve onto Eckford at higher rates of speed. Opposition began to mount in a meaningful way when the DOT’s presentation turned to North Henry Street and the recommended changes to two different sections. 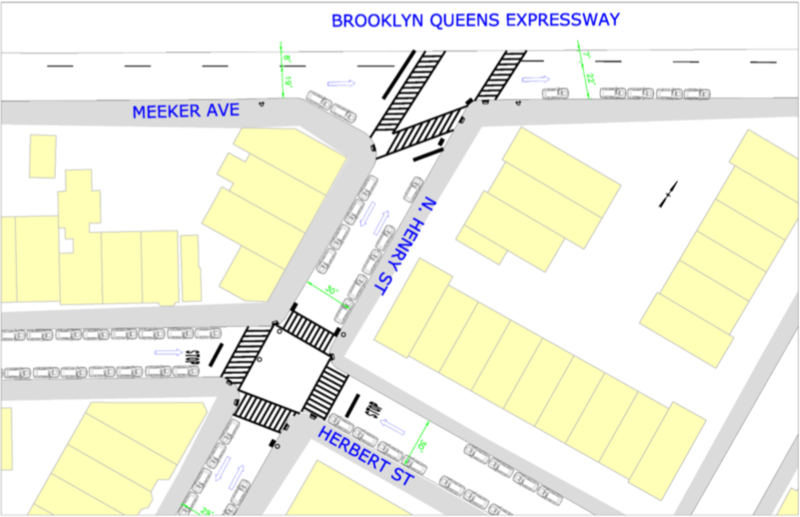 First, at North Henry between Richardson Street and Meeker Avenue, another narrow section of road would be turned into a one-way street, heading northbound toward Meeker and the BQE. In addition to the one-way change, a curb extension would be added to the west side of North Henry at Meeker, cutting down the space where drivers previously made righthand turns to drive southbound on North Henry. The DOT representatives stated that the changes wouldn’t create much change in available parking spaces. 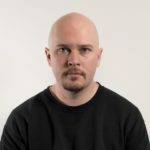 Residents are concerned, however, that they’ll spend too much time looking for parking as they’re forced to loop around an extra couple blocks due to the one-way change. 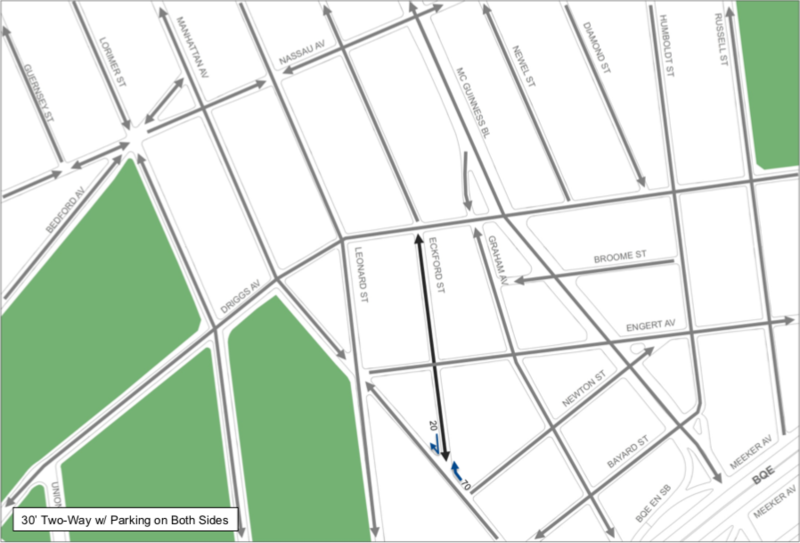 At rush hour especially, Meeker Avenue is difficult to navigate, and many spoke out at the Community Board meeting about the potential time lost to commuters that live on North Henry as they seek out parking. Speculation about the L train closure and increased congestion on North Brooklyn streets played into their concerns as well. 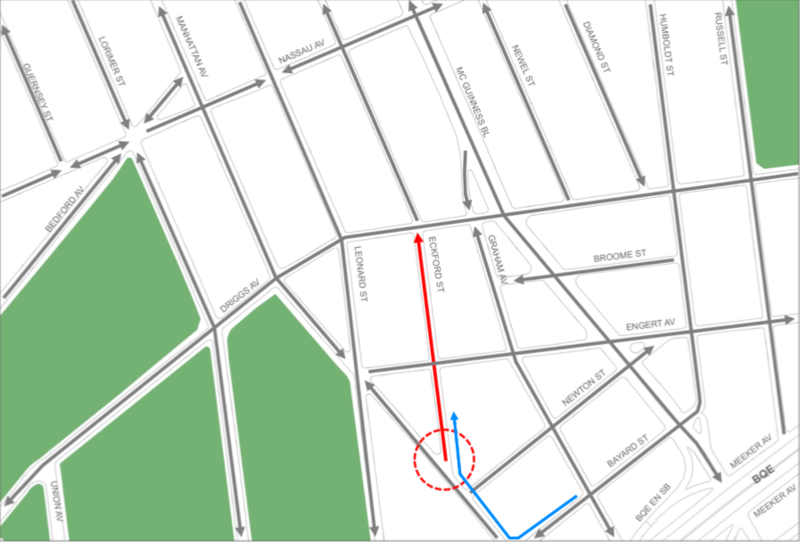 Another section of North Henry Street, this one running between Greenpoint and Nassau Avenues, was the final topic of the presentation. 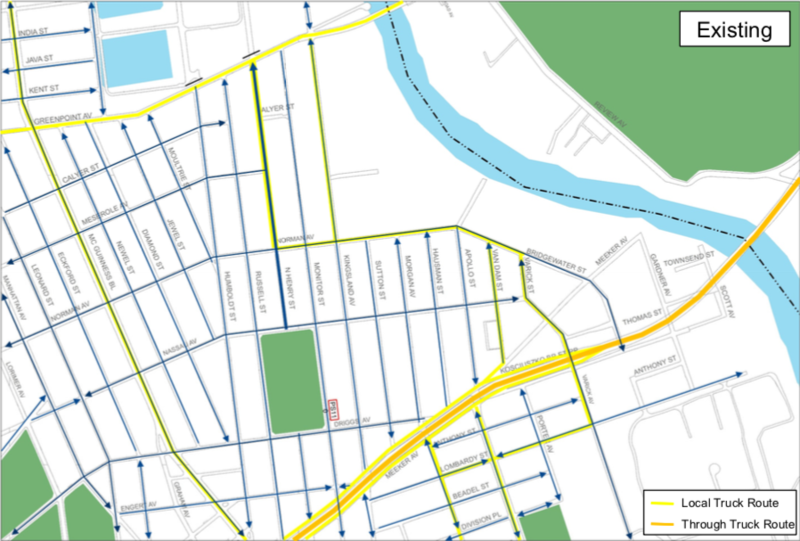 The DOT proposed two solutions to issues on the street, which is a truck route from Greenpoint to Norman, but neither option appealed to residents of North Henry. 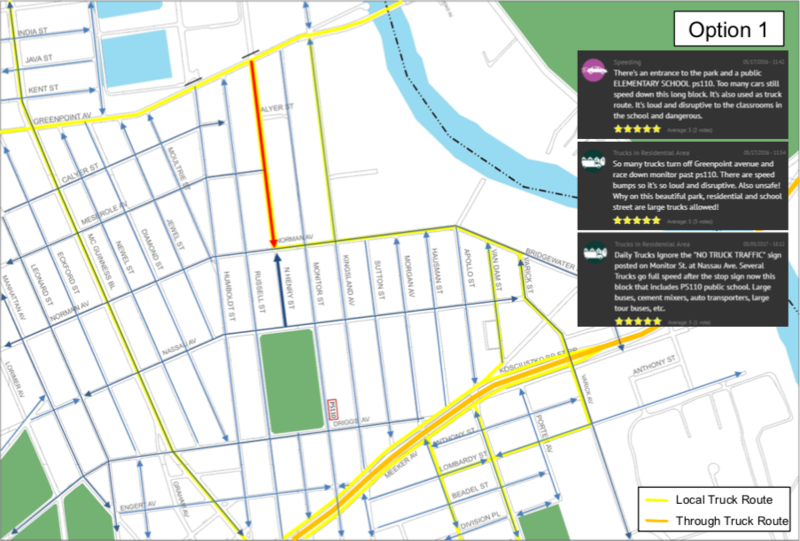 The first option would create a southbound one-way street on North Henry from Greenpoint down to Norman, which would lead to a head-on intersection with northbound North Henry. 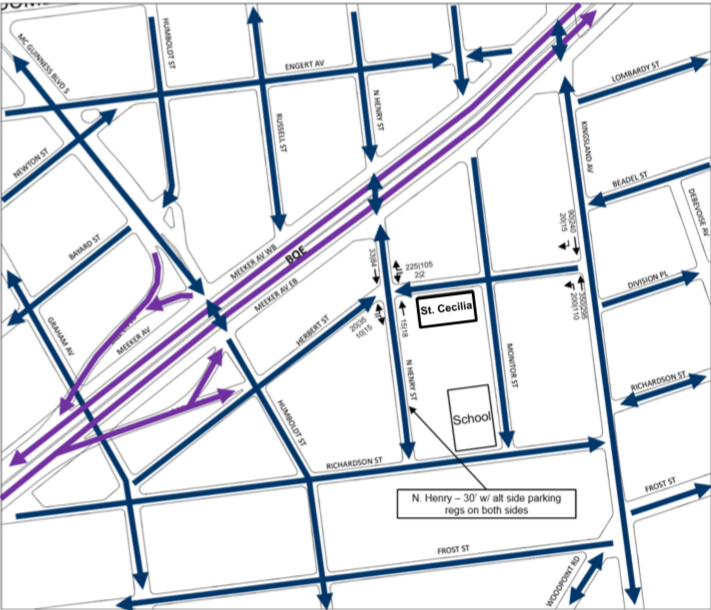 The secon would continue the southbound one-way all the way to Nassau, terminating at McGolrick Park. Residents in the area are worried about trucks in their neighborhoods, both as a danger to children and as a quality of life issue—noise, diesel fumes and the like. Of course, serving the mixed nature of North Brooklyn is difficult: industrial, commercial and residential properties intermingle in the neighborhood, which makes any DOT proposition a “lesser of two evils” situation. For now, the DOT is just presenting the findings from the study to the community and making non-binding recommendations. The actual capital projects that would enact the recommendations lie much further down the road, after community board approval, budgeting, and the like. For now, concerned residents have made their voices heard, and it remains to see whether they’ll get their way. Retaliation for Lentol not backing Congestion Parking in Albany. This is how DOT operates.